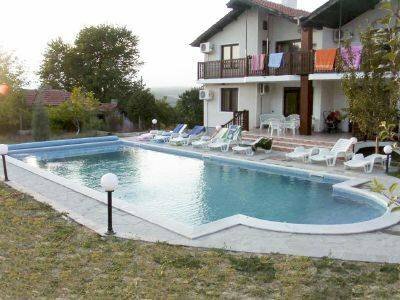 The Villa is in the quiet village of Kitka which is situated among the gently rolling hills of Bulgaria’s picturesque countryside, and is 5km from the beautiful river Kamchia It is16km to the coast and the delta and several coastal resorts. The vibrant and cosmopolitan city of Varna is only 24km away and the airport is 34km. The village itself is ideal for those wishing to get away from it all, with very little traffic and only the sound of the occasional bray of a donkey or the chirping of crickets to accompany you as you sit on your balcony and sip your wine or rakia. A traditional Bulgarian-style villa which has been renovated and modernised in 2006 to a very high standard to ensure that you have everything you are used to expecting at home with air-conditioning throughout. The result is a spacious, airy and light environment, with excellent décor and all new modern fixtures and fittings.The actual area of the building is 385m2. and covers three floors. There is a security alarm system linked to a local security company and the double gates are controlled internally via an intercom system. The main floor areas are tiled with terracotta to a high standard and the bedrooms have high quality Swedish laminate flooring. The pool, balconies, patios and gardens are all south facing ensuring sun from dawn till dusk. This is open plan with entry from the side of the house and comprises a hall with staircase, dining area, breakfast area, galley kitchen, living area, and bedroom. The Dining Area – has a large, stylish, modern extendable wooden dining table with 8 high backed dining chairs. The Kitchen – Galley-style equipped with - microwave, halogen hob with extractor hood, eye-level oven, dishwasher, kettle, toaster and a generous complement of cooking utensils, crockery and cutlery - there is also an American- style fridge- freezer with external ice-maker. The Living Area – tastefully decorated in relaxing colours and with a luxurious cream Italian Leather corner suite, which comfortably seats six people. Situated in this area is a wall mounted 32" LCD TV with satellite reception and a DVD player. The dining area, living area and bedroom all look out onto the swimming pool and gardens and two sets of double doors lead out onto a large tiled patio area with patio chairs, settees and tables. From this elegant patio wide tiled steps lead down to the pool, which is surrounded by a feature-stone paved area with up to 10 sun-loungers available. This is accessed from the hall area where a wrought iron and wooden staircase , hand made by a local craftsman, leads up to a spacious landing which houses large wardrobes and cupboards for storage of linen, towels etc. There are three further bedrooms on this floor. Master Bedroom – a large bedroom with king-size bed, fitted wardrobes and bedside units and has an adjacent dressing room with dressing table. This leads to the en-suite bathroom with sumptious step-in Jacuzzi bath, hand basin and toilet, leading into a separate large shower room. Second Bedroom – a double room with fitted wardrobes, bedside units and dressing table. Third Bedroom – a double room with two single beds and a camp-bed available if required. There are fitted wardrobes, bedside units, a dressing table and an en-suite bathroom which has a corner bath, hand basin and toilet. The door locks are such as to allow access from Second bedroom if necessary. All the bedrooms have access to the balcony overlooking the pool. This contains - 2 Single garages and 3 storage rooms. Laundry Room with washing machine, sink & iron with ironing board. The 2 x 200ltr boilers are housed here for ample supplies of hot water. Gardens – are extensive ( 2000m2 / ¼ acre ) with lawns, assorted fruit trees, walnut trees and providing panoramic views of the surrounding countryside. Swimming Pool – The large heated pool (10mx 6mx0.x1.5m) incorporates a children’s area (2m x6m x0.5m) and has underwater and surround area lighting which makes night-time viewing an experience to be enjoyed. There is also the luxury of heated water to be enjoyed should you want it. The Barbeque – this is housed in a separate, very attractive building to the side of the villa and has it’s own lighting and power supply which when illuminated further adds to the delightful night-time visual experience.